Cats love chasing little dots of light. I don’t why – they have no smell, and look nothing like a mouse, there’s no reason that cats should be as fascinated by laser dots as they are. But, then, humans do a lot of things that make no sense, too, and at least a kitty chasing a laser point is harmless, cute, and makes the cat and its human happy. We sent our product tester one of these cheap laser pointers to see how his cats liked it. On with the review! 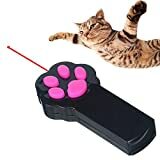 This cat/kitten laser light pointer is a cheap, simple cat toy. It does require batteries – a couple of standard AAA, which are easy to find almost anywhere. 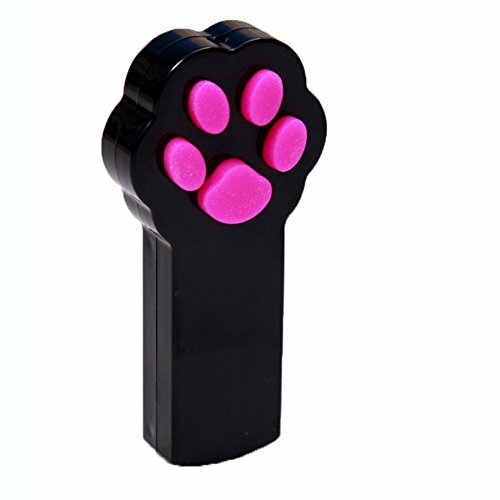 The laser pen has a cute paw design push button operation, and is small enough to be stored in a drawer when not needed, or packed in a travel pouch when you take kitty on vacation. First impressions were good – frustration-free packaging always steers me towards approving of a product. I’m old enough to remember the hideous days where things in plastic sleeves arrived either heat-sealed by an industrial sealer, and thus nearly impregnable to mere mortals, or shot full of staples. A simple slide-off plastic sleeve with the item lightly tied to a strip of cardboard is much easier to deal with! The picture diagram on the back of the cardboard sleeve made it clear (it was fairly obvious to begin with, but having these things spelled out saves time) which of the paw-pad buttons to press. Batteries in, cat located, and it was time for the fun to begin! That the battery cover was a simple slide off design was also good: I find catch-mechanisms a little tricky, and there is one clock in my house which never gets put forward or back, because I can’t find the specific type of screwdriver its battery cover needs anywhere in my local town. But this laser pointer seems to be all about simplicity, which makes sense, as playing with a cat is one of life’s simple pleasures. Cats are uncomplicated creatures, and their toys and games should be likewise. The laser dot is very bright, and the shape and weight of the laser pointer makes it easy to direct the beam, without shining the light into your eyes, or the cat’s. Within seconds, Orbus had noticed the dot, and was captivated by it, chasing it all around the room, leaping halfway up walls, and generally providing his humans with a lot of fun. He did seem a little slow to pick up where the dot was if it wasn’t directly in his line of sight, but that may simply be his being a young kitten still, and needing time to develop his all-round hunting awareness. Valkyria, the matriarch of my little kitty community (and a very regal cat who does not often play with toys) was really into the laser toy, chasing the pointer dot with enthusiasm, clearly trying to work out where it might appear next, and getting very frustrated when she couldn’t see it. Watching her play with the laser, it was almost as though she was a kitten again. Limina, while not nearly as fanatical about the pursuit of the dot as Orbus had been, was still very much engaged with the game, and stalked, rather than chased, the laser point. Unlike Valkyria and Orbus, Limina didn’t watch for the dot, and, after a while of stalking it, seemed to get bored, and came over for cuddles. She has, however, always been much more of a lap cat than Valkyria. Definitely a good buy, especially as it seems to happily amuse all three of my cats. Wow! Oh, wow, this is, like, everywhere! Okay, cool – I’m up the wall with this – right, it’s over there now, okay, chase it round, jump, spin, do a kind of head over heels – that’s got it. Wait, where’d it go? Where is it? Wait, hang on – that’s it, got you! I could literally do this for hours! Orbus’ Verdict: Four paws, a tail, and meows for this. Love it! Hello? What’s this? Something to chase? That you’re not going to tell me to leave alone? Oh, this is fun. I like this – it’s much better than silly little balls which can only go to particular places; I have to think about where this little dot of light is going to be next. Intellectual occupation is very much my thing – I’m basically a tenured professor in the feline world. It’s nice that you seem to be beginning to realise that I have quite a considerable brain. Valkyria’s Verdict: Four paws for this, human – you got it right for once. Hi! Oh…you want me to play with something? Okay. So… it’s like hunting, only there’s nothing to really catch. But it’s a nice way to stretch, and get a little bit of an indoor work out. And at least you’re here, playing with it too. I like it when you’re here. Limina’s Verdict: Three paws. It’s fun for a while, but I wouldn’t do it all day. Can I have a cuddle, now?